located in Piper Park was established in 1982. 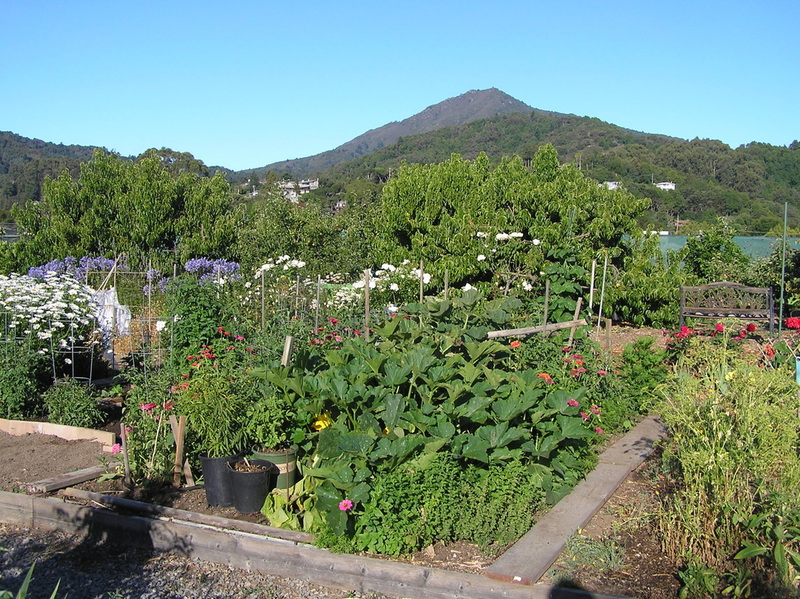 If you are interested in joining the garden community and if you live in Larkspur or Greenbrae, contact and sign up with the Larkspur Recreation Department. Greetings to all. 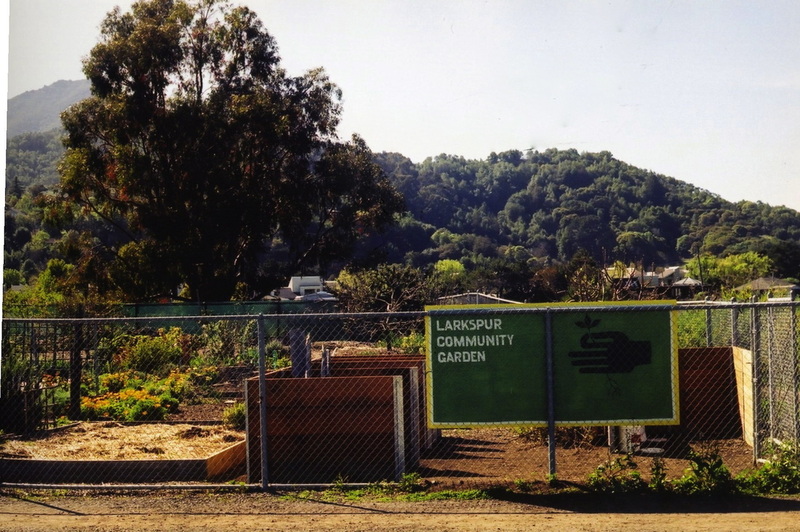 Welcome to our 37th year of organic growing at The Larkspur Community Garden. We had a very nice Workday gathering and potluck. The sky was blue and the sun quickly warmed us as we met our new gardeners who had just received their Orientation and heard about what is new and what is happening in the garden. We shared and renewed our knowledge about our Orchard care, Compost procedures and Food Bank success. We now have volunteers to help us design and plant garden #20 for Food Bank donations. All of us were also asked to consider planting something additional in our own garden for the Food Bank. eg. An extra row of carrots or spinach or a tomato or pepper etc…. It all helps. Gardeners signed up for Food Bank deliveries, the Rose Committee and Compost processing. If you have anticipated volunteering, please contact Katherine Jones (Orchard), Paul DaSilva (Compost), Jill Hutchinson (Food Bank and Rose Committee) or let me know. 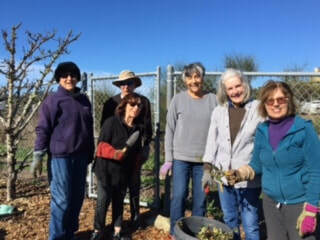 The highlight of the day was the wonderful interaction of our gardeners as we went about weeding, digging, trimming and renewing our garden for our Spring Season and then sharing a delicious potluck. This day was our opportunity to meet our new gardeners and refresh our feelings of community and build friendships and share stories and ideas. I want to thank those gardeners who had already participated by helping us with Alternative tasks, easing our garden Workday load and making our garden look so nice. We miss being with you too, but value your taking part in our Community activity. As the year unfolds we will be asking for help with new projects and regular seasonal garden events which enable us to function as community. Thank you for all you do to make our garden work so well. P.S. This is a good time to make your 2019 garden design plan. Remember to feed your soil with amendments and/or organic fertilizers and a good amount of mulch, ( leaves, straw, or bags of store bought mulch ). It will hold water and suppress emerging weed seeds. Compost helps to increase good soil, more worms and microorganisms which are necessary for growing great vegetables. This is organic gardening. FYI.This year our focus will be upon keeping our plants within our gardens. Plants too close to the edge will get larger and grow over your border. 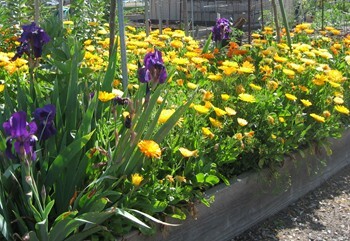 They may look pretty, but alyssum, calendula, nasturtium, artichoke, zucchini, vines, roses, zinnias, geraniums etc.. need to be kept inside your border. Please give them a wide berth to grow. If needed, transplant them further into your garden so you don’t have to keep cutting them back just as they look good. Both they and you will be happier. Something to watch for is stinging nettle which has found its way into over 17 locations in our garden, mostly gardens and aisles. It likes an area that has not been cultivated often. You want to wear gloves, (you don’t want to get stung), and carefully dig it out and remove it by its network of small roots. You need to revisit the area every four months for any re-emergence. In some areas it has come back three years in a row. It spreads by roots and seeds which can spread four feet in one season This is an unpleasant weed and an unpleasant, but, necessary task. Already seven additional gardens have been readied for new gardeners. Take a look around at all these new gardens-to-be. They are full of potential. We want our new gardeners to bring their new ideas into a clean garden and not have to contend with any left-over remnants of former gardening. If you should ever need to leave our garden community, we hope this is the way you will return your garden to us. Thank you to everyone who helps make our garden look so nice. -Mulch, mulch, and mulch. Can you water twice or even just once a week? - Food Bank begins in July and runs through mid October. Visitors are welcome to tour the garden when there are garden members working. Visitors are always invited to ask questions. We ask only that you stay on the paths and not walk inside individual gardens, and of course, no picking. In an Organic garden the soil is the foundation of a healthy eco system. That is why Organic gardeners feed the soil and not the plant. The soil then serves as the reservoir for water and the vital nutrients that the plant requires for growth.